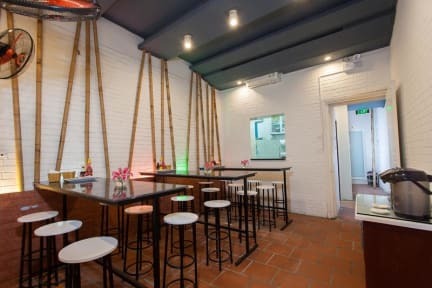 Hanoi Friends Inn is perfectly located in the very heart of Hanoi's Old Quarter offering you one of the most convenient places to stay in Hanoi city. At Hanoi Friends Inn, there is no distance between host and guest. You just have fun, be happy and enjoy every minute of your vacation. With less than a 7 minute walk to the Night Market, and around a 10 minute walk to Hoan Kiem Lake or Dong Xuan Central Market, you can have easy access to restaurants, nightlife and historical sites in a blink. Our target that to build Hanoi Friends Inn becomes a second home, and create a friendly, family atmosphere for every single guest that we welcome through our doors for you. We strive to make your stay safe, but most of all enjoyable. Imagine you are coming to a brother’s house, as we will not just treat you as a tourist. 1. We accept payment in both Credit card and Cash. 2. Cancellation made above 3 days: No fees are charged. If later, the first night will be charged. In case of No-show: Total booking will be charged. 3. Check in time: 14.00pm. Check out time: 12.00pm. 4. Pet is not allowed in Hanoi Friends Inn. 5. Whole the building is non-smoking. Please do not smoke inside Hanoi Friends Inn. Absolutely loved staying at Friends Inn. The staff are so lovely and helpful, always smiling, keen to make sure you have a good time. Location is great (very close to Banh Mi 25!) and you’ll get a little map with staff picks for best pho and noodle salad etc - worth following their advice! We stayed here twice and the second room (deluxe double on the 5th floor) was probably the nicest room we’ve stayed in SE Asia, for a reasonable price. Definitely recommended! Excellent experience at Friends Inn! Nick and Harry were very helpful for planning my trip. I arrived super early at 5:45am and they opened the doors for me to get settled in. Breakfast was great and staff was always helpful! I would definitely recommend staying here! Derrick even drove me to go buy some coffee to bring back home for my family after his shift was over! This is not a party hostel, so if that is what you are looking for then look elsewhere. Overall A+ experience! We LOVED our stay here. The staff was amazing and went above and beyond to help us. Max, Harry, Derrick, and Duin were all so friendly and always willing to stop what they were doing to help. They booked two overnight excursions for us (both of which were amazing), they gave us great suggestions of things to do in Hanoi and the best places to eat, and helped us plan out our days. The rooms are clean and spacious. Beds are comfy. Breakfast is delicious! Highly recommend this place! The staff was very helpful and friendly. The hotel is close to the old quarter and very clean as well. Definitely worth the money. We stayed one night here and used them to book our trip to halong bay. Staff, particularly nick, were very helpful and happy to help! On returning from Halong bay they even let us leave our bags until the evening, great when we weren't actually staying there again. Room was basic but clean and had a comfortable night's stay; worth what we payed. We had a great stay and were well looked after. The staff were very friendly and helpful - they called up a restaurant to book it for us and answered any questions we had. Hanoi Friends Inn & Travel was an amazing stay. The staff were all eager to help out with any questions we had, helped us book tours, and even took me on a bike halfway across town to get my phone back after leaving it on a tour bus (oops haha). The private room was spotless and amazing for the price. The free breakfast was very nice, we enjoyed the location, and definitely made Hanoi a memorable stay. Huge thanks to Max and everyone else who gave us a great Hanoi experience! The staff was the best part of this place. My room didn't have a window. I'm never going to like that....seems to be a thing in Asia. It was nice that there were always little bananas out in the common space if you needed a snack and didn't want to brave the outside. Wasn’t anything like I expect. Dark and not happy environment. Checked out early..